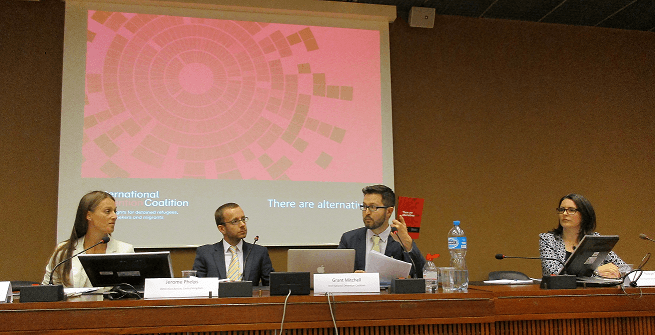 Geneva, Switzerland: The IDC launched its latest research at the 30th Session of the UN Human Rights Council, hosted by the Office of the High Commissioner for Human Rights (OHCHR) in partnership with the Permanent Mission of Sweden. With human migration reaching unprecedented levels, many States are struggling to respond to new refugee, asylum-seeker and migrant arrivals. Current crises highlight the need for alternative approaches that respect fundamental right to liberty, security, and human dignity, while still ensuring that States can responsibly govern their borders. Over the past five years, the IDC has undertaken a program of research to identify and describe a number of positive alternatives to immigration detention (‘alternatives’) that respect fundamental rights, are less expensive and are equally or more effective than traditional border controls. During the event the importance of research such as There are alternatives, which intends to provide guidance for those in positions to prevent the use of unnecessary detention, was highlighted, along with the need for increased transparency and accountability in immigration detention. Lead author of the research, Dr. Robyn Sampson, Research Fellow Swinburne University of Technology, discussed the key findings of the report, with over 250 examples of alternatives from over 60 countries covered. The cast array of alternatives available were highlighted, including a presumption of liberty in law in Argentina, the prohibition of detention of vulnerable individuals in China and Panama, and the use of screening and assessment tools to inform placement decisions in the United States and Zambia. Your support in sharing this ground breaking research amongst your networks is greatly appreciated.